In tough economic times, where investment opportunities are nearly non-existent, buying into precious metals and gold proof coins seem to be the only way out to preserve the value of the falling currency. However, before you plunge head over heels into the gold dollar coins market, check out our article that debunks common myths and presents no-nonsense facts to lead you through the maze of precious metals investing. 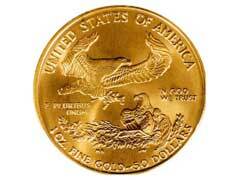 Myth: Buying gold dollar coins will establish a 100% recession proof investment in all economic environments. Fact: Not true. The value of gold dollar coins is directly related to current precious metals market price, if this price goes down, the value of your coins will be undoubtedly get decreased no matter what the numismatic value of your coin is. Myth: According to President Roosevelt’s historical Gold confiscation act of 1933 that he signed in the light of severe monetary and banking crises, individuals were forced to turn in their bullion coins to make up for Government budget deficit and save the future of the country. Buying only rare pre-1933 coins like, for example, $20 gold coins is the only way to protect your gold investment from similar acts in the future. Fact: Buying exclusively pre-1933 gold Eagle coin or any other historical American coins without proper numismatic knowledge is making yourself potentially prone to all kinds of gold scams or simply paying too much for the “historical” value that might not even be realistic. It’s highly unlikely that in the modern times individuals will be forced to sell their gold dollar coins for a fraction of a price to make up for the Government’s budget deficit. On the other hand, buying bullion coins like American Buffalo gold Bullion coins that are made from the purest 24 karat all American gold will provide a sound and safe investment for the future. Myth: In tough economic times such coins are the only sound investment to get into due to gold’s absolute liquidity. Fact: If we are truly talking about tough economic times when people are facing losing homes and hunger, the liquidity of gold dollar coins is highly doubtful. You might have trouble finding somebody to purchase these coins from you, so the this liquidity is highly dubious during severe economic crisis. Taking time to carefully evaluate these common myths or facts will help you make an informed decision of weather you should invest in precious metals or choose an alternative financial mechanism.